- What are the basics of ABA? - Why choose ABA for my child? - What can I expect from an ABA program? - What can I expect from an ABA therapist? - What if I have doubts? - Additional Resources What is ABA? Applied Behavior Analysis (ABA) is the science of modifying socially significant behavior (Cooper, Heron, & Heward, 2006). ABA focuses on understanding and changing behavior. What does this mean? In other words, ABA provides us with guidance for changing the behavior that is important to both you and your child. Science - Science refers to a systematic method of collecting and analyzing information/data to find the truth (Cooper, Heron, & Heward, 2006). Essentially, this means that science is not based on thoughts, ideas or opinions—it is based on fact. ABA is a science because it is supported by research and its principles have been proven true. 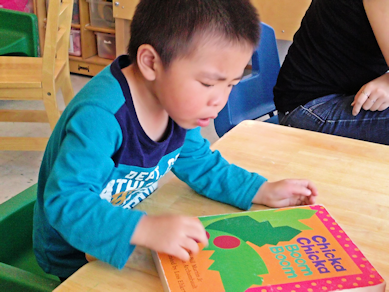 At Hand in Hand Early Childhood Center, we believe in using evidence-based procedures. We believe that you and your child deserve services that we know are effective. Because ABA is a science, we know it is effective, and we know that it can help your child. Modify - In the field of ABA, we discuss modifying behavior. This means that we are looking to either increase or decrease behaviors. Our goal is to increase appropriate, functional behaviors and to decrease inappropriate, interfering behaviors. Behaviorists increase or decrease (i.e. modify) behavior by using various strategies. 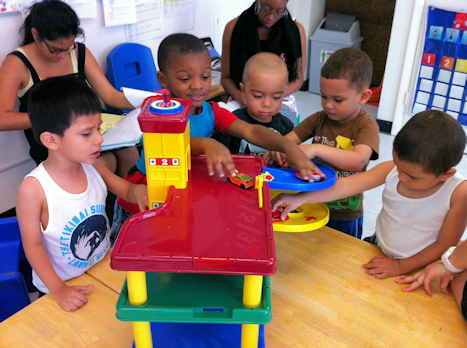 At Hand in Hand Early Childhood Center, we focus on using reinforcement to modify behavior. We focus on reinforcement because research indicates that it will be most effective for your child long-term. Socially-Significant - When deciding which behaviors to modify, behaviorists always consider which behaviors are socially-significant. This means that we are looking to address the behaviors that are most important for you and your child in your everyday life. We cannot address every behavior at the same time (nor would we want to! )—we must decide which behaviors are important for your child at that particular time, and start there. As your child progresses, the behaviors that are socially-significant for him/her will change, and we will continually alter our interventions and supports to meet his/her needs. At Hand in Hand Early Childhood Center, we are consistently thinking about your child’s future and the needs of your family—that is how we, with your help, determine which behaviors are socially-significant. Behavior - Behavior is anything a person or animal does. According to “The Dead Man’s Test”, behavior is anything that a dead person cannot do (Cooper, Heron, & Heward, 2006). For instance, a dead person cannot laugh, blink, or walk, so these are all behaviors. While many things technically qualify as behavior, in the world of ABA, we focus on the behaviors that we can see. Clapping your hands is a behavior that we can see, so that is a behavior we might address in ABA. Thinking, on the other hand, is not a behavior we can observe—we cannot see what someone is thinking, so this is not a behavior we address in ABA. Of course we acknowledge that your child has thoughts and feelings. However, because we cannot see or measure them, we will not make assumptions about how your child feels or thinks. What we will do is address the behaviors that may result from those thoughts or feelings. What are the basics of ABA? In the world of ABA, there are a few basic tools and guidelines we utilize. Here is a brief look at some of the key basics now. Please note that this is not meant to serve as a comprehensive behavior modification manual. ABC’s: When analyzing behavior, we always look at (and record data on) the ABC’s (antecedents, behaviors, consequences). This information helps us to understand your child’s behavior and to decide how we can best help him/her. Antecedent: What happened before the behavior? Behavior: What does the behavior look like? Consequence: What happened after the behavior? Functions of Behavior: After we record data on the ABC’s of your child’s behavior, we will then use that information to identify the function(s) of the behavior in question. In ABA, we believe that every behavior occurs for a reason. The first step in changing a behavior is to understand why it is occurring—we call this the function of the behavior. We always address a behavior according to its function (i.e. why the behavior is occurring), not based on what the behavior looks like (e.g. crying, hitting). There are four primary behavioral functions—every behavior falls under one of these four categories. 1. Attention: Your child engages in this behavior in order to get the attention of another person. 2. Avoidance: Your child engages in this behavior in order to avoid or delay doing something. 3. Access: Your child engages in this behavior in order to gain access to something he/she wants. 4. Automatic: Your child engages in this behavior because the behavior itself is enjoyable to him/her, and for no other outside reason. Reinforcement and Punishment: Behaviors can be increased or decreased depending on what happens immediately following them (this is the “consequence” mentioned in the ABC’s section). Anything that follows a behavior and makes that behavior more likely to occur again in the future is called reinforcement. Anything that follows a behavior and makes that behavior less likely to occur again in the future is called punishment. Behaviorists use reinforcement and punishment to modify behavior. Remember, at Hand in Hand Early Childhood Center, we focus on using reinforcement to increase your child’s appropriate behavior. Why choose ABA for my child? Example 1: One day you decide to try out a new hair salon you have never used before. The next day, when you go to work, you receive lots of compliments on how lovely your hair looks! After receiving all of these compliments, you will most likely go back to that same salon the next time you need a haircut, right? This is an example of reinforcement! The compliments you receive will increase your behavior of going to that new hair salon. Remember, any time we increase a behavior, we are discussing reinforcement. Example 2: One day at the dinner table, your nose feels itchy and you decide to put your finger in it. Your friends and family say, “ew! That’s disgusting! I can’t believe you picked your nose!” This reaction from your loved ones will probably make you less likely to pick your nose again in the future, right? This is an example of punishment. The reaction from your friends and family will decrease your behavior of nose-picking. Remember, any time we decrease a behavior, we are discussing punishment. What can I expect from an ABA program? Applied Behavior Analysis will benefit your child in multiple ways. Let’s discuss just a few of the benefits you can expect at Hand in Hand Early Childhood Center. As mentioned above, Applied Behavior Analysis is a science and is based on data. Because Hand in Hand Early Childhood Center is an Applied Behavior Analysis program, we will consistently record data on your child’s behavior. We record data on interfering behaviors (e.g. hitting, crying), communication (e.g. pointing, words, phrases), programming (e.g. receptive identification of objects, matching identical objects), social skills (e.g. playing with peers, participating in group activities), activities of daily living (e.g. hand washing, toilet training), and much more! We also perform assessments to determine your child’s strengths and areas of need (e.g. VB-MAPP, Bayley Assessment). We use this data to find the areas where your child may need assistance, and then provide him/her with the necessary support. We also use this data to determine if the support we are offering is effective, or if we need to change our intervention. Our data is graphed on a daily basis. This ensures that we are constantly tracking your child’s progress and that we can prove if he/she is moving forward! 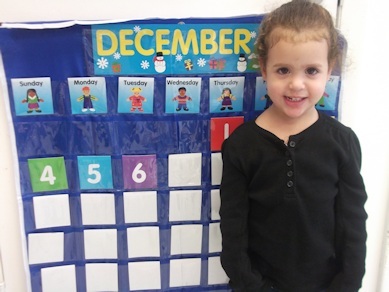 In an ABA program like Hand in Hand Early Childhood Center, you can expect evidence of your child’s learning. Our data is available to you at any time. At Hand in Hand Early Childhood Center, and many other ABA programs, your child will be provided with a one-to-one Teaching Assistant. 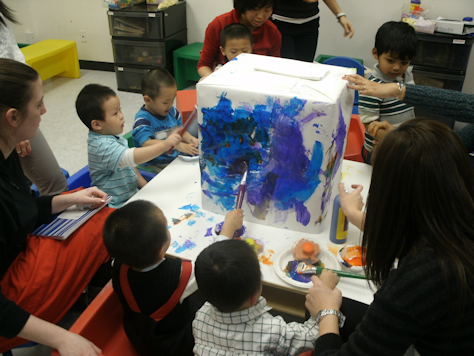 Each child receives one-to-one attention throughout his/her session at the Center. Our Teaching Assistants are provided with extensive training in ABA and are supervised by one of our Lead Teachers. Your child’s Teaching Assistant and Lead Teacher will work collaboratively with you to create the specialized instruction your child needs. In addition to a one-to-one Teaching Assistant, your child may also be provided with an interdisciplinary team (e.g. Special Educators, Psychologists, Social Workers, Speech and Language Pathologists, Occupational Therapists). At Hand in Hand Early Childhood Center, we believe that you, the caregivers, are valuable members of this team! Because ABA is a science and its methods have been proven effective, it is reasonable to expect that you will see behavioral progress in your child. As previously mentioned, these principles and strategies are research-based. At Hand in Hand Early Childhood Center, our goal is the same as yours: to help your child progress and meet his/her fullest potential. We utilize principles of ABA to help us achieve this goal. What can I expect from an ABA therapist? An effective ABA therapist will be well-trained in behavioral principles, fluent in appropriate teaching strategies, and proficient in data collection and analysis. A strong ABA therapist will be able to build a positive relationship with both you and your child, as this is key in your child’s learning process. The development of a trusting and positive relationship is the first step of any good intervention. When working with very young children, ABA therapists have a responsibility to collaborate with caregivers and to serve as knowledgeable resources for them. Finally, ABA therapists are expected to operate under an ethical code of conduct, ensuring that they protect the best interest of your child. 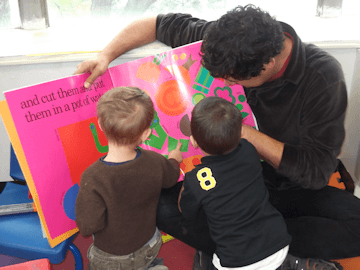 At Hand in Hand Early Childhood Center, all of our staff members have been intensively trained in these skills and are provided with ongoing training, support, and supervision to ensure they are maintained. 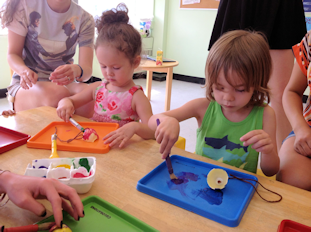 At this early age, Hand in Hand Early Childhood Center may be your child’s first school experience! We recognize that this is an important and potentially difficult transition for both of you! Feelings of excitement, nervousness, or doubt (to name a few!) are all perfectly natural. 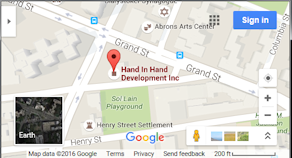 Rest assured that the qualified staff at Hand in Hand Early Childhood Center are dedicated to your child’s success. We act only in your child’s best interest and, therefore, have an open-door policy at the Center. Each classroom is equipped with an observation window and you are invited to observe your child’s sessions at any time. When observing, we only ask that you give us advanced notice and that you remain outside of the classroom, to avoid disruption to your child’s learning, or the learning of other students in the classroom. In addition to observation, we are willing to answer any and all questions that may arise, as well as provide you with support, guidance, and training in ABA methodology. As previously mentioned, we consistently record data on your child’s progress, which provides you with objective information on his/her learning. Although behavioral change rarely occurs overnight, with effective modification techniques, behavior can be changed. We ask that you give ABA and Hand in Hand Early Childhood Center time and patience as we work with your family. We are on your team and will provide you with any information, support, or resources you may need.